Congratulations to our former PhD Student Henning on the publication of his new book. The book is a product of Henning’s PhD thesis and six years of hard work with fantastic results. 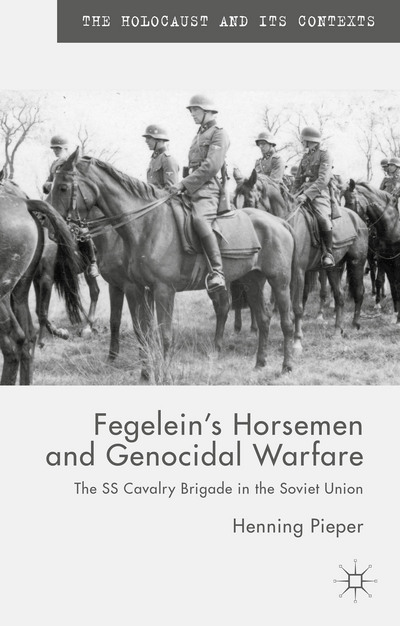 Fegelein’s Horsemen and Genocidal Warfare explores the deployment of the SS Cavalry Brigade in 1941-2, with a special focus on the development of its ‘dual role’. The brigade became a pacemaker of the Holocaust in Belorussia during the summer of 1941, and fought against the Red Army in the region between Toropets and Rzhev, a focal point of the eastern front, between December, 1941 and June, 1942. SS cavalrymen underwent a continuous brutalisation which saw them commit acts of mass violence with thousands of victims, a development only comparable to that of the Einsatzgruppen and battalions of the order police. Going beyond a unit history, Henning analyses the role and behavior of the brigade’s personnel and places it within the context of research on perpetrators and the operational history of the Waffen-SS. Thus, military history, Holocaust research, and perpetrator history are combined in this interdisciplinary approach. This entry was posted in News and tagged Belorussia, Holocaust, miltary history, PhD, russian and east european history, Soviet Union on November 13, 2014 by Alice Johnstone.